Ghost Recon Wildlands’ new trailer gives us another glimpse at its varied sandbox, from snow-swept mountains to dense jungles, along with a look at some in-game action – all of it narrated over by Sergeant McBeardygruffvoice. Get in the mood for Wildlands with our list of the best sandbox games on PC. The new trailer is all about the Ghosts, what they do (kill people), how they do it (with guns) and where they do it (bloody everywhere). Wildlands – playable entirely on your own or in up to four-player co-op – sends your group behind enemy lines and asks you to dismantle a Bolivian drug cartel. Do you want to put a bullet in the heads of the cartel generals (yes) or do you want to use them to get more intel (probably not) – we’re promised plenty of choice in how you approach the open-world’s varied missions. 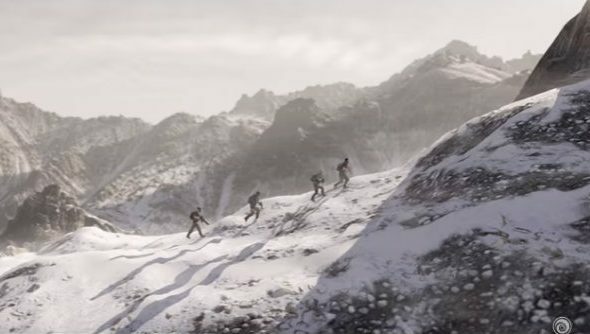 “As part of the Tom Clancy franchise, authenticity is one of the key pillars which will bring the Wildlands to life in our latest installment in the franchise,” said Eric Couzian, creative director on Tom Clancy’s Ghost Recon Wildlands. Anyone who pre-orders the game will also receive “The Peruvian Connection” bonus mission.